This last week I had the great fortune to have some great food with our beer. On Thursday I went to a brewer’s night at the Trainwreck pub in Burlington which has great burgers with hand-cut fries and their own jalapeño ketchup. We ordered some jalapeño popper appetizers, not those frozen fried guys, but fresh hand-made, wrapped in bacon. It’s weird because jalapeños are usually not that spicy but we were all feeling the heat from these ones. It might have been more intense by all the Boundary Bay IPA I was drinking because hoppy beers can make spicy food taste hotter. Friday I attended the third of three brew master dinners at Semiahmoo Resort. 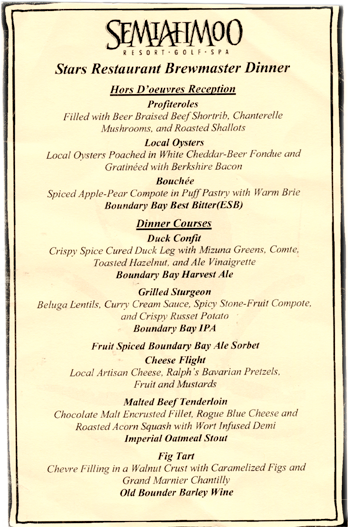 Each course was paired with and/or cooked with Boundary Bay beer by their talented head chef Andy Dixon. There were three appetizers all paired with ESB. They were all great but I think my favorite was the profiteroles filled with beer braised short ribs, chantrelle mushrooms and roasted shallots. I gotta say though, that I don’t eat oysters and I had two of these poached with cheddar-beer fondue and gratined with Berkshire bacon. The bacon is what really sold me. The first dinner courses were also eye openers for me. I was always a little picky since I was a kid. I’ve never liked dark meat or eating fat, skin or meat on the bone. That said, I’ve never been a big fan of duck, as it is usually dark and pretty fatty. The duck confit was delicious with the meat in thin strips on top of comte cheese and mizuna greens. So, two foods in a row that I usually wouldn’t eat, but really enjoyed, and they went well with the beers paired with them. The next dinner course was exciting for me because I had never had sturgeon before. I was surprised by this meaty fish. Chef Andy really impressed me with this well thought out dish and pairing. The sturgeon was served on a bed of Beluga lentils that resembled caviar and a curry cream sauce. It was paired with Boundary’s IPA and I liked how he paired an English curry (with Indian influence) with an English beer style (again with an Indian connection). So it impressed me on two levels. Not only was it well thought out and clever, but it also tasted great. That would have been the high note for me if it wasn’t for the next course, which I think was most people’s favorite. The malted beef tenderloin was a chocolate malt encrusted fillet with rogue bleu cheese on top. Underneath this beautiful tender meat was a bed of roasted acorn squash and a wort infused demi. We had to find an extra plate and split it up between us at my table because we loved this so much. It was paired with Imperial Oatmeal Stout which might sound like a big heavy beer but it worked on several levels with this dish. Imperial oatmeal stout goes well with creamy bleu cheeses and it also went well with the chocolate malt encrusted around the tenderloin. Dessert was a caramelized fig tart paired with Old Bounder Barley wine, which was a nice way to finish up the night. Well done Chef Andy! 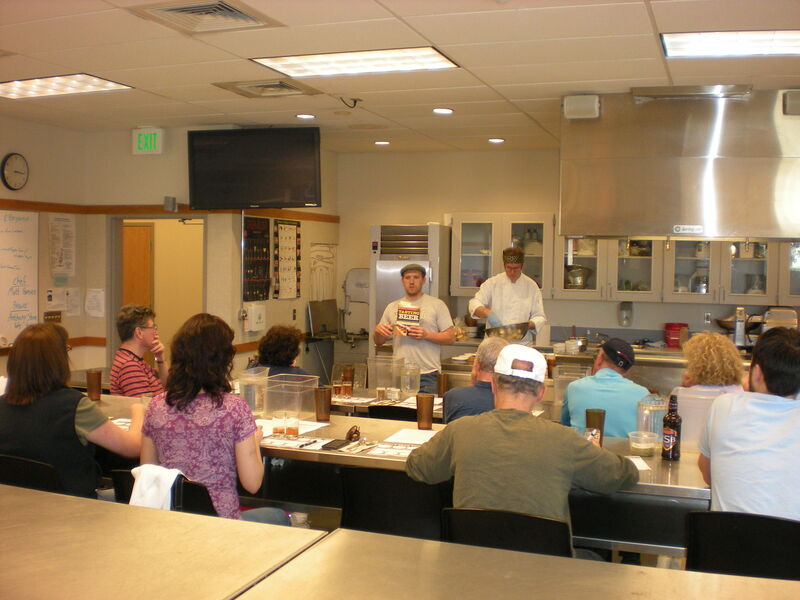 This last month I taught my first craft beer tasting class and my second homebrewing class at the Bellingham Technical College. First of all I want to apologize to the people who missed the tasting class due to the date change. Secondly, I want to sincerely thank everyone who came to both classes. 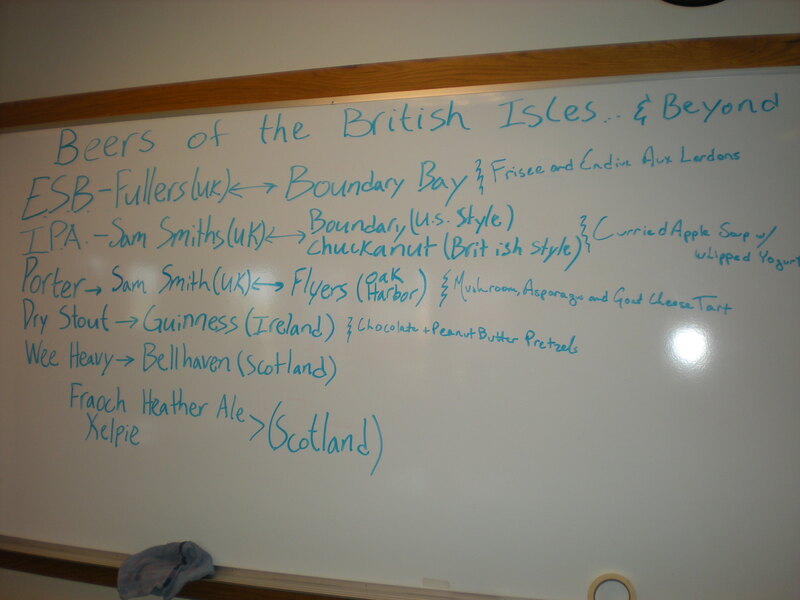 I’m glad that there are so many people in Bellingham who are so beer-centric. I am going to take a break from the homebrewing class this Winter quarter and come back in the Spring. This Winter I’m working with the college right now to do two tasting classes, the “Introduction to Craft Beer Styles Tasting” and a “Winter Beer Tasting“. The tasting class went pretty well but I think next time will be even better. We started with a Kolsch and Pilsner from Chuckanut Brewery that were very tasty. From Boundary Bay Brewery we had ESB, Scotch Ale, IPA, Imperial Oatmeal Stout, and Old Bounder. I meant to replace one of those with a beer from the North Fork Brewery, but didn’t get my act together. Next time I will make sure to make that happen. Finishing it all off was a Kriek Lambic (cheery sour beer) from Belgium. Most of the beers had food paired with them. My favorite was my wife’s lavender cookies with the IPA. I wanted to focus on locally made and/or available food and beer for two reasons. First of all, because I want to support local business. And because I didn’t want to offer hard to find beers. If people really liked them it would be frustrating for them to know that they can’t get them in town. 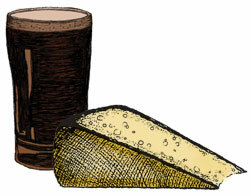 I bought the cheese and kriek at my local Haggen’s, though I would like to get the cheese at Quell Fromage next time. I got the deli meat from Old World Deli and oh, man was it good. Thanks to Trevor Tomlinson at Old World for helping me make such difficult decisions. I also got Gouda cheese made in Ferndale along with apples and pears from Bellewood Acres. Sorry again to those who missed the class. I know it’s cruel to say this, but it was great having extra for the rest of us. 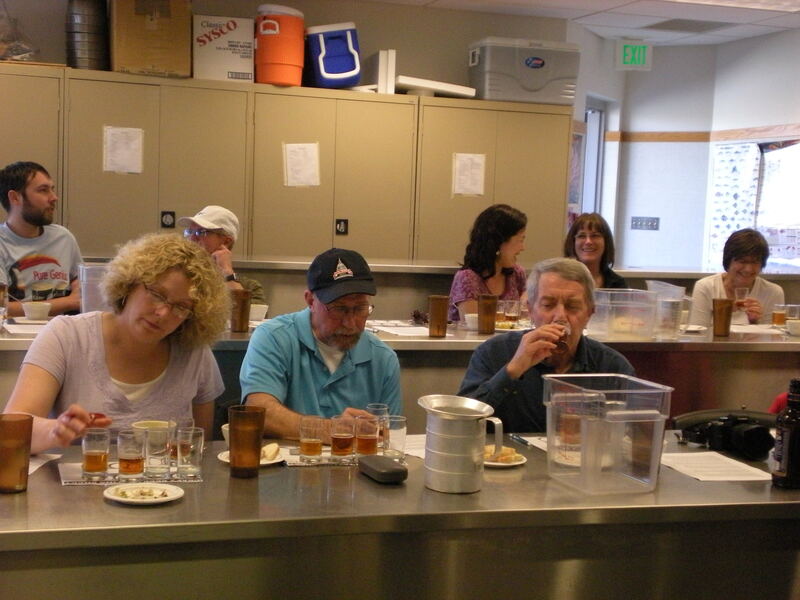 I had about three times as many people sign up for the introduction to homebrewing class this time around, which led to some changes in the class structure. 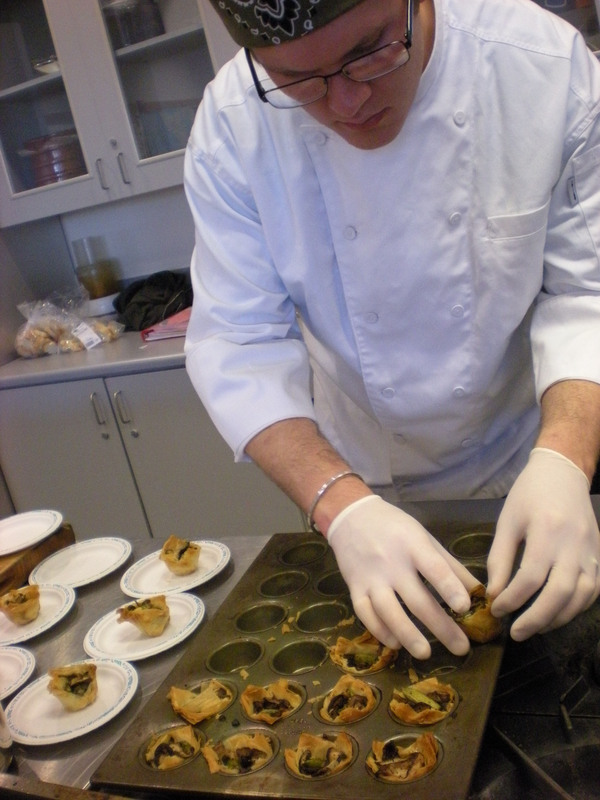 Compared to the last class, this one was less hands on and more demonstration. But the goal remains the same. 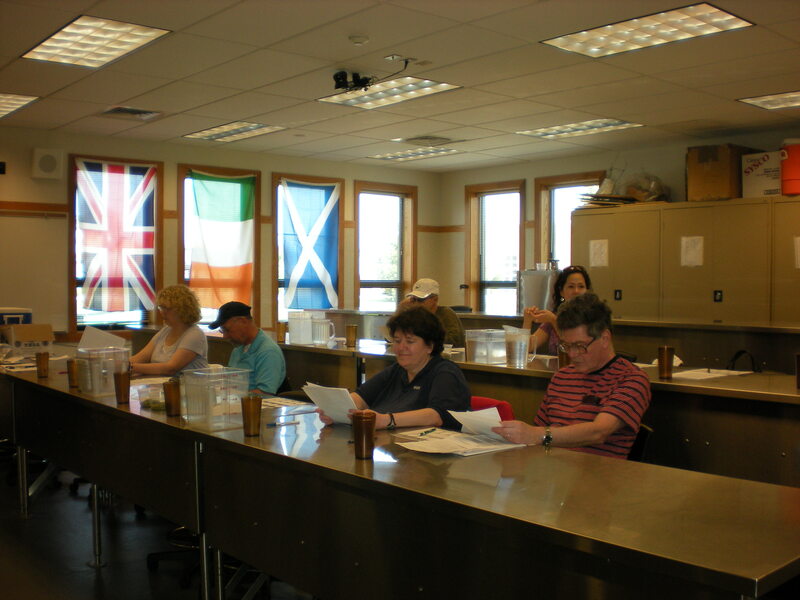 The class will help people get started brewing on their own at home. This time it went a little smoother and I had better timing than the last time around which meant everyone got to leave on time which was nice. Thank you to Nick Crandall for his help. I really couldn’t do it with out him. After talking about beer for three hours it was great to go home and enjoy one. If only the Huskies could have pulled out a victory that night, it would have been about a perfect day for me. Cheers!